» Should We Lower Dues for Older Fraternity Brothers? Is lowering dues for older members a smart thing to do? Is the lowering of dues as an incentive a good way to keep brothers motivated? My plan for lowering dues is that for every year a brother is active and in good standing his dues will be lowered by $40.00. The dues would start at $240.00 and cannot be no lowered to less than $80. We are a chapter of thirty four brothers. I understand what you are trying to do. It is hard to keep older brothers motivated to be involved in the chapter. As a result, they complain that they don’t want to pay their fraternity dues. You are trying to throw them a bone for being loyal to the chapter. Your strategy is a poor one though. You are solution does not address the problem. The problem here is your older brothers probably do not feel the same connection to the fraternity that they used to. The chapter did not grow with them like it should. Your challenge as president is to make sure that ALL brothers feel like they are getting value out of their membership. Every brother needs to feel like their dues are a good investment. Fortunately, this isn’t the hardest group to please. If they are still around after a few years, they believe in the chapter and have stuck around for a reason. You need to make sure you cater to this group a little more than you probably have been. They don’t want to party like rock stars every weekend. They are past that stage of life. They are more focused on graduating and then starting their careers. Many of them are in committed relationships and their girlfriends aren’t probably wild about hanging out at the house and playing beer pong all night. Think about ways that the fraternity can help these guys with the goals they have. Can the fraternity do a better job reaching out to alumni for career advice / assistance for these brothers? Can the chapter have more date functions that will cater to the relationships older brothers are in? Does the chapter keep room on the intramural teams for older brothers? Don’t forget to recognize these guys when you can. Put them up for awards and scholarships. Be sure the younger guys in the chapter realize what these brothers did for the chapter before the new guys were initiated. Go to these guys for advice. You will learn from guys who have been there before. You will also make these guys feel like they are still a vital part of the chapter because they will still have a critical role in shaping it. Finally, be sure you don’t promote a culture of giving the old guys a rash of crap when they do come around. Everyone knows it is done as a joke, but the old guy who is receiving it won’t feel that way. He’ll look at the nerdy freshman and think “who the hell is this kid to give me crap about being here?” And then he’ll stop coming around. If you catch the young guys doing this, pull them aside and correct them. If the chapter appreciated when these guys came around, they may actually come around more. The challenge you have is a common one. 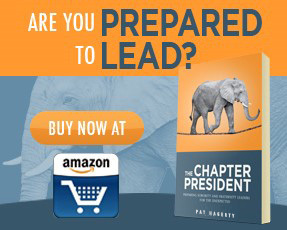 I actually addressed it a little more in depth in my new book – The Chapter President – which will be out in early January. Provide excellent value to the older brothers and your problem will be solved.